Pyyyowng. There are few noises more iconic than a ricochet in the classic Westerns of the ‘40s – a pitch-bending yowl straight off the Looney Tunes soundboard. Of course, they were all hitscan weapons back then, bullets bouncing from gun to target in a split-second of suspended disbelief. But that sound made it seem as if the shells were whizzing all around, rebounding from saloon signs and splitting open barrels of beer. That’s the fantasy that SteamWorld Heist makes real. Related: the best deals in the 2017 Steam Summer Sale. Out of everything in the Steam Summer Sale, this is the one to take a punt on – a turn-based tactics game not easily compared to any other, and polished like a colt pistol on John Wayne’s front porch. It works like this: you command a team of up to four cowbots – a pun that doesn’t work nearly as well in the mouth as it does on paper – from a larger cast of steam-powered characters. Each turn, you direct them through 2D networks of rooms aboard a procedurally-generated spaceship, taking cover where appropriate. 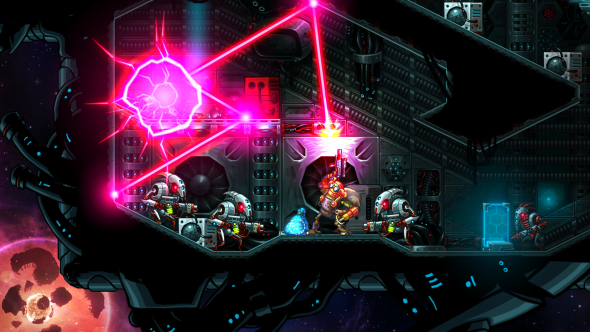 The rooms are populated with space pirates, explosive barrels, and bags of swag, all strewn across multiple vertical platforms. And they’re typically housed between walls with lots of obtuse angles, perfectly suited for bouncing bullets off. 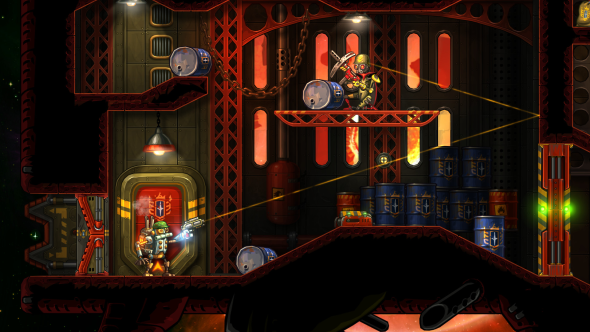 But here’s the best bit: SteamWorld Heist’s steady pace is paired with the precision aim of a twitch shooter. Sure, you might have moved to the most opportune space, and calculated that you can do enough damage to bring down a beam golem. But you’ll need to line up the shot just so if any of that’s going to matter. Taking control of a character with a laser-sighted gun is like suddenly seeing the Matrix – with a line of trajectory drawn onto the map, you can pick one of several possible futures. Fire straight ahead, and your bullet might clip the head of a pirate, sending his hat spinning towards the feet of a comrade; a cosmetic treat they could enjoy for the rest of the game. Shoot upwards, and that same bullet might wind up connecting with a glowing generator, destroying terrain you could otherwise use for cover. Conversely, a shot in precisely the wrong direction might take a roundabout route to the back of your target’s head, causing critical damage and sending them collapsing into pieces. Eventually, you’ll start to draw the lines in your head, and Heist’s most satisfying moments come when the sights are off: Revolver in hand, squinting like Eastwood as your bot’s hand drifts lazily back and forth. Then you squeeze the trigger, at exactly the right angle to bounce a grenade off the ceiling and into the hidey-hole of some unlucky royal guardsman. Sorry, varmint. Heist’s greatest asset is its single plane of perspective. Rather than a concession to budget – or a hangover from SteamWorld Dig, the Metroidvania that came before it – the sidelong view is a crucial design decision. 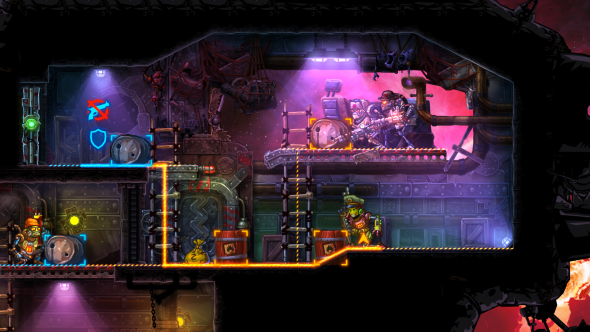 By closing down the dimensions, SteamWorld Heist allows its possibilities to become, well, probable. It couldn’t happen the same way in a 3D game. Call it the Team17 problem: while projectiles in Worms 3D could feasibly cause unintended chain reactions, they tend not to, since there’s so much more open space. It’s presumably one of the reasons why Thief designer Randy Smith has retreated to 2D for recent games like Waking Mars: the flat dimension simply makes the cascading events celebrated in his earlier work far more likely to occur. 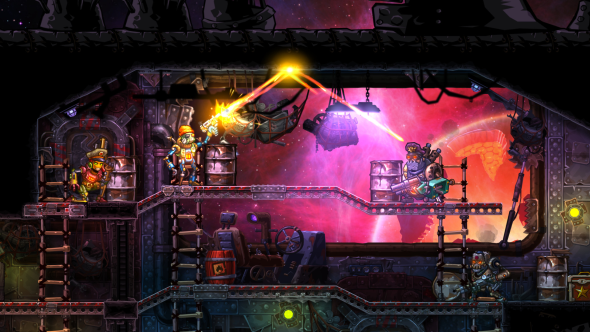 In SteamWorld Heist, all this makes for the perfect shootout simulator: a deadly conversation between cover, terrain, and a couple of pistols. Plus, some of the hats have rims wider than Clint’s. There’s some reassembly required, but these robot cowboys are just as good as the (‘40s impression of the) real thing.